First compiler check the condition inside the While loop. 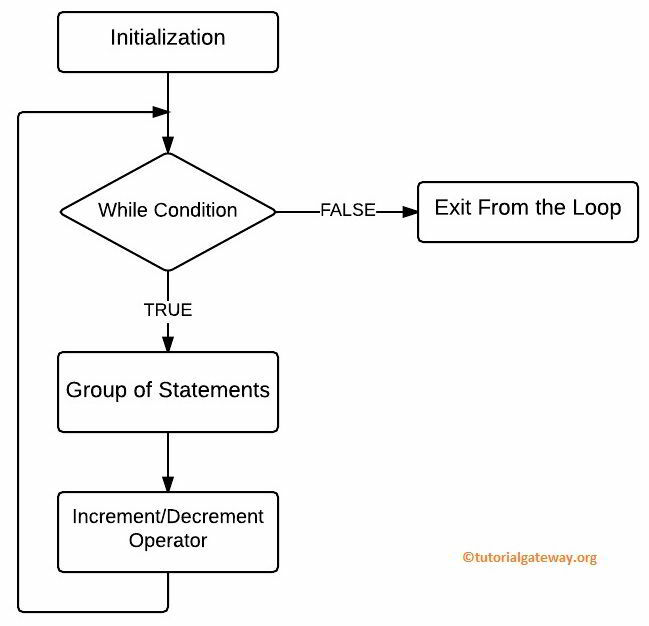 If the Condition is True then the statement or group of statements under the while loop block will be executed. If it is False, compiler will come out of the while loop and execute other statements outside the while loop. TIP: For single statement curly braces are not required. However, if we omit them for multiple statements then it will execute the first statement only. It is always good practice to use braces all the time. If the While condition is True then it will execute the code inside the while loop. Again it will check the while condition after the value incremented. As long as the condition is True, the code inside the while loop will be executed. In this program, we declared a number variable and assigned value 6. Using this value, compiler will add those values up to 10. In the next line we used ++ operator to increment the number value. After incrementing the process will be repeated until the condition results False.